Recreational drug use is the use of a psychoactive drug to alter one's mental state in a way that modifies emotions, perceptions, and feelings for recreational purposes. When a substance enters the user's body, it brings on an intoxicating effect, often referred to as a "high". Generally, people use recreational drugs that fall into three categories: depressants (these drugs produce a feeling of relaxation and calmness); stimulants (these drugs give the user a sense of energy and alertness); and psychedelic drugs (these cause hallucinations and perceptual distortions that some users find appealing). In popular usage, it is generally considered to be a tolerated social behaviour rather than a serious medical condition such as self-medication. 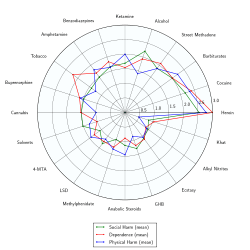 Drugs commonly considered capable of recreational use include alcohol (the active ingredient in beer, wine and distilled spirits), marijuana and hashish, nicotine (in tobacco), caffeine (in coffee and black tea), and some controlled substances and illegal drugs within the scope of the United Nations' Single Convention on Narcotic Drugs and Convention on Psychotropic Substances. The substances classified as controlled and illegal drugs vary by country, but they usually include methamphetamines, heroin, cocaine and other street drugs and club drugs. In 2009 it was estimated that about 3% to 6% of people aged 15 to 65 had used illegal drugs at least once (149 to 270 million). International and domestic law enforcement agencies are perpetually occupied with interdiction efforts against illegal drug use, manufacture, and distribution. Many researchers have explored the etiology of recreational drug use. Some of the most common theories are: genetics, personality type, psychological problems, self-medication, gender, age, instant gratification, basic human need, curiosity, rebelliousness, a sense of belonging to a group, family and attachment issues, history of trauma, failure at school and/or work, socioeconomic stressors, peer pressure, juvenile delinquency, availability, historical factors, or sociocultural influences. There has not been agreement around any one single cause. Instead, experts tend to apply the biopsychosocial model. Any number of these factors are likely to influence an individual’s drug use as they are not mutually exclusive. Regardless of genetics, mental health or traumatic experiences, social factors play a large role in exposure to and availability of certain types drugs and patterns of drug use. Anthropological research has suggested that man "may have evolved to counter-exploit plant neurotoxins". The ability to use botanical chemicals to serve the function of endogenous neurotransmitters may have improved survival rates, conferring an evolutionary advantage. A typically restrictive prehistoric diet may have emphasised the apparent benefit of consuming psychoactive drugs, which had themselves evolved to imitate neurotransmitters. Chemical–ecological adaptations, and the genetics of hepatic enzymes, particularly cytochrome P450, have led researchers to propose that "humans have shared a co-evolutionary relationship with psychotropic plant substances that is millions of years old." Addiction experts in psychiatry, chemistry, pharmacology, forensic science, epidemiology, and the police and legal services engaged in delphic analysis and ranked 20 popular recreational drugs by their dependence liability and physical and social harms. Severity and type of risks that come with recreational drug use vary widely with the drug in question and the amount being used. There are many factors in the environment and within the user that interact with each drug differently. Overall, some studies suggest that alcohol is one of the most dangerous of all recreational drugs; only heroin, crack cocaine, and methamphetamines are judged to be more harmful. However, studies which focus on a moderate level of alcohol consumption have concluded that there can be substantial health benefits from its use, such as decreased risk of cardiac disease, stroke and cognitive decline. This claim has been disputed. Researcher David Nutt stated that these studies showing benefits for "moderate" alcohol consumption lacked control for the variable of what the subjects were drinking, beforehand. Experts in the UK have suggested that some drugs that may be causing less harm, to fewer users (although they are also used less frequently in the first place), include cannabis, psilocybin mushrooms, LSD, and ecstasy. These drugs are not without their own particular risks. The concept of "responsible drug use" is that a person can use drugs recreationally or otherwise with reduced or eliminated risk of negatively affecting other aspects of one's life or other people's lives. Advocates of this philosophy point to the many well-known artists and intellectuals who have used drugs, experimentally or otherwise, with few detrimental effects on their lives. Responsible drug use becomes problematic only when the use of the substance significantly interferes with the user's daily life. Responsible drug use advocates that users should not take drugs at the same time as activities such as driving, swimming, operating machinery, or other activities that are unsafe without a sober state. Responsible drug use is emphasized as a primary prevention technique in harm-reduction drug policies. Harm-reduction policies were popularized in the late 1980s, although they began in the 1970s counter-culture, when cartoons explaining responsible drug use and the consequences of irresponsible drug use were distributed to users. Another issue is that the illegality of drugs in itself may also cause social and economic consequences for those using them—the drugs may be "cut" with adulterants and the purity varies wildly, making overdoses more likely—and legalization of drug production and distribution would reduce these and other dangers of illegal drug use. Harm reduction seeks to minimize the harm that can occur through the use of various drugs, whether legal (e.g., alcohol and nicotine), or illegal (e.g., heroin and cocaine). For example, people who inject illicit drugs can minimize harm to both themselves and members of the community through proper injecting technique, using new needles and syringes each time, and proper disposal of all injecting equipment. In efforts to curtail recreational drug use, governments worldwide introduced several laws prohibiting the possession of almost all varieties of recreational drugs during the 20th century. The West's "War on Drugs" however, is now facing increasing criticism. Evidence is insufficient to tell if behavioral interventions help prevent recreational drug use in children. Alcohol is the most widely used drug in Australia tried one or more times in their lives by 86.2% of Australians aged 12 years and over, while 34.8% of Australians aged 12 years and over have used cannabis one or more times in their lives. In the 1960s, the number of Americans who had tried cannabis at least once increased over twentyfold. In 1969, the FBI reported that between the years 1966 and 1968, the number of arrests for marijuana possession, which had been outlawed throughout the United States under Marihuana Tax Act of 1937, had increased by 98%. Despite acknowledgement that drug use was greatly growing among America's youth during the late 1960s, surveys have suggested that only as much as 4% of the American population had ever smoked marijuana by 1969. By 1972, however, that number would increase to 12%. That number would then double by 1977. The Controlled Substances Act of 1970 classified marijuana along with heroin and LSD as a Schedule I drug, i.e., having the relatively highest abuse potential and no accepted medical use. Most marijuana at that time came from Mexico, but in 1975 the Mexican government agreed to eradicate the crop by spraying it with the herbicide paraquat, raising fears of toxic side effects. Colombia then became the main supplier. The "zero tolerance" climate of the Reagan and Bush administrations (1981–93) resulted in passage of strict laws and mandatory sentences for possession of marijuana and in heightened vigilance against smuggling at the southern borders. The "war on drugs" thus brought with it a shift from reliance on imported supplies to domestic cultivation (particularly in Hawaii and California). Beginning in 1982 the Drug Enforcement Administration turned increased attention to marijuana farms in the United States, and there was a shift to the indoor growing of plants specially developed for small size and high yield. After over a decade of decreasing use, marijuana smoking began an upward trend once more in the early 1990s, especially among teenagers, but by the end of the decade this upswing had leveled off well below former peaks of use. Many movements and organizations are advocating for or against the liberalization of the use of recreational drugs, notably cannabis legalization. 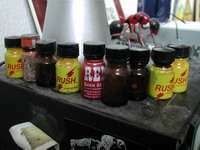 Subcultures have emerged among users of recreational drugs, as well as among those who abstain from them, such as teetotalism and "straight edge". 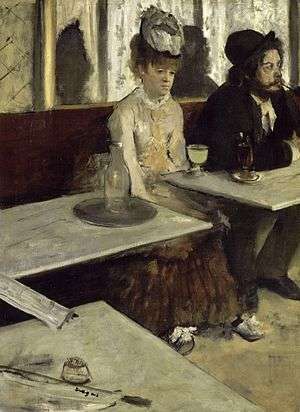 The prevalence of recreational drugs in human societies is widely reflected in fiction, entertainment, and the arts, subject to prevailing laws and social conventions. In video games, for example, enemies are often drug dealers, a narrative device that justifies the player killing them. Other games portray drugs as a kind of "power-up"; their effect is often unrealistically conveyed by making the screen wobble and blur. 2OH. 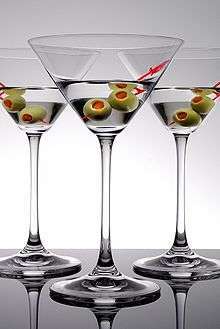 Drinking alcohol creates intoxication, relaxation and lowered inhibitions. It is produced by the fermentation of sugars by yeasts to create wine, beer, and distilled liquor (e.g., vodka, rum, gin, etc.). In most areas of the world, apart from certain countries where Muslim sharia law is used, it is legal for those over a certain age (typically 18–21). It is an IARC 'Group 1' carcinogen and a teratogen. Alcohol withdrawal can be life-threatening. Amphetamines: Used recreationally to provide alertness and a sense of energy, whether for all-night studying or all-night dancing. Prescribed for ADHD, narcolepsy, depression and weight loss. A potent central nervous system stimulant, in the 1940s and 50s methamphetamine was used by Axis and Allied troops in World War II, and, later on, other armies, and by Japanese factory workers. It increases muscle strength and fatigue resistance and improves reaction time. 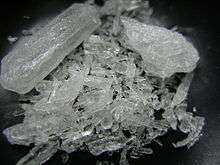 Methamphetamine use can be neurotoxic, which means it damages dopamine neurons. As a result of this brain damage, chronic use can lead to post acute withdrawal syndrome. Cannabis: Its common forms include marijuana and hashish, which are smoked or eaten. It contains at least 85 cannabinoids. The primary psychoactive component is THC, which mimics the neurotransmitter anandamide, named after the Hindu ananda, "joy, bliss, delight." The review article Campbell & Gowran (2007) states that "manipulation of the cannabinoid system offers the potential to upregulate neuroprotective mechanisms while dampening neuroinflammation. Whether these properties will be beneficial in the treatment of Alzheimer's disease in the future is an exciting topic that undoubtedly warrants further investigation." Caffeine: Often found in coffee, black tea, energy drinks, some soft drinks (e.g., Coca-Cola, Pepsi and Mountain Dew, among others), and chocolate. Cocaine: It is available as a white powder, which is insufflated ("sniffed" into the nostrils) or converted into a solution with water and injected. 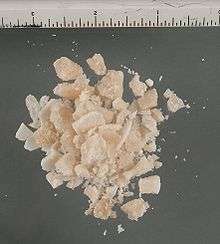 A popular derivative, crack cocaine is typically smoked. When transformed into its freebase form, crack, the cocaine vapour may be inhaled directly. This is thought to increase bioavailability, but has also been found to be toxic, due to the production of methylecgonidine during pyrolysis. MDMA: Commonly known as "Ecstasy", it is a common club drug in the rave scene. Ketamine: An anaesthetic used legal by paramedics and doctors in emergency situations for its dissociative and analgesic qualities and illegally in the club drug scene. LSD: A popular ergoline derivative, that was first synthesized in 1938 by Hofmann. However, he failed to notice its psychedelic potential until 1943. In the 1950s, it was used in psychological therapy, and, covertly, by the CIA in Project MKULTRA, in which the drug was administered to unwitting US and Canadian citizens. It played a central role in 1960s 'counter-culture', and was banned in October 1968 by US President Lyndon B Johnson. Nitrous oxide: legally used by dentists as an anxiolytic and anaesthetic, it is also used recreationally by users who obtain it from whipped cream canisters (see inhalant), as it causes perceptual effects, a "high" and at higher doses, hallucinations. Opiates and opioids: Available by prescription for pain relief. Commonly abused opioids include oxycodone, hydrocodone, codeine, fentanyl, heroin, and morphine. Opioids have a high potential for addiction and have the ability to induce severe physical withdrawal symptoms upon cessation of frequent use. Heroin can be smoked, insufflated or turned into a solution with water and injected. Psilocybin mushrooms: This hallucinogenic drug was an important drug in the psychedelic scene. Until 1963, when it was chemically analysed by Albert Hofmann, it was completely unknown to modern science that psilocybe semilanceata ("Liberty Cap", common throughout Europe) contains psilocybin, a hallucinogen previously identified only in species native to Mexico, Asia, and North America. Tobacco: Nicotiana tabacum. Nicotene is the key drug contained in tobacco leaves, which are either smoked, chewed or snuffed. It contains nicotine, which crosses the blood–brain barrier in 10–20 seconds. It mimics the action of the neurotransmitter acetylcholine at nicotinic acetylcholine receptors in the brain and the neuromuscular junction. The neuronal forms of the receptor are present both post-synaptically (involved in classical neurotransmission) and pre-synaptically, where they can influence the release of multiple neurotransmitters. 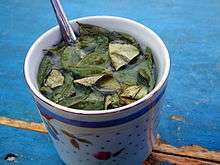 DMT – primary ingredient in ayahuasca, can also be smoked in a crack pipe; briefly (c. 30 minutes) causes a "total loss of connection to external reality"
Research chemicals: 2C variants, etc. Drugs often associated with a particular route of administration. Many drugs can be consumed in more than one way. For example, marijuana can be swallowed like food or smoked, and cocaine can be "sniffed" in the nostrils, injected, or, with various modifications, smoked. insufflation: also known as "sniffing", this method involves the user placing a powder in the nostrils and breathing in through the nose, so that the drug is absorbed by the mucous membranes. Drugs that are "sniffed" include powdered amphetamines, cocaine, heroin, ketamine and MDMA. intravenous injection (see also the article Drug injection): the user injects a solution of water and the drug into a vein, or less commonly, into the tissue. Drugs that are injected include morphine and heroin, less commonly other opioids. Stimulants like cocaine or methamphetamine may also be injected. In rare cases, users inject other drugs. Many drugs are taken through various routes. Intravenous route is the most efficient, but also one of the most dangerous. Nasal, rectal, inhalation and smoking are safer. The oral route is one of the safest and most comfortable, but of little bioavailability. Depressants are psychoactive drugs that temporarily diminish the function or activity of a specific part of the body or mind. Colloquially, depressants are known as "downers", and users generally take them to feel more relaxed and less tense. Examples of these kinds of effects may include anxiolysis, sedation, and hypotension. Stimulants or "uppers", such as amphetamines or cocaine, which increase mental and/or physical function, have an opposite effect to depressants. Depressants are widely used throughout the world as prescription medicines and as illicit substances. When these are used, effects may include anxiolysis (reduction of anxiety), analgesia (pain relief), sedation, somnolence, cognitive/memory impairment, dissociation, muscle relaxation, lowered blood pressure/heart rate, respiratory depression, anesthesia, and anticonvulsant effects. Some are also capable of inducing feelings of euphoria (a happy sensation). Depressants exert their effects through a number of different pharmacological mechanisms, the most prominent of which include facilitation of GABA and/or opioid activity, and inhibition of adrenergic, histamine and/or acetylcholine activity. Antihistamines (or "histamine antagonists") inhibit the release or action of histamine. "Antihistamine" can be used to describe any histamine antagonist, but the term is usually reserved for the classical antihistamines that act upon the H1 histamine receptor. Antihistamines are used as treatment for allergies. Allergies are caused by an excessive response of the body to allergens, such as the pollen released by grasses and trees. An allergic reaction causes release of histamine by the body. Other uses of antihistamines are to help with normal symptoms of insect stings even if there is no allergic reaction. Their recreational appeal exists mainly due to their anticholinergic properties, that induce anxiolysis and, in some cases such as diphenhydramine, chlorpheniramine, and orphenadrine, a characteristic euphoria at moderate doses. High dosages taken to induce recreational drug effects may lead to overdoses. Antihistamines are also consumed in combination with alcohol, particularly by youth who find it hard to obtain alcohol. The combination of the two drugs can cause intoxication with lower alcohol doses. Hallucinations and possibly delirium resembling the effects of Datura stramonium can result if the drug is taken in much higher than therapeutical dosages. Antihistamines are widely available over the counter at drug stores (without a prescription), in the form of allergy medication and some cough medicines. 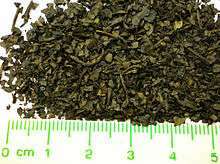 They are sometimes used in combination with other substances such as alcohol. The most common unsupervised use of antihistamines in terms of volume and percentage of the total is perhaps in parallel to the medicinal use of some antihistamines to stretch out and intensify the effects of opioids and depressants. The most commonly used are hydroxyzine, mainly to stretch out a supply of other drugs, as in medical use, and the above-mentioned ethanolamine and alkylamine-class first-generation antihistamines, which are - once again as in the 1950s - the subject of medical research into their anti-depressant properties. For all of the above reasons, the use of medicinal scopolamine for recreational uses is also seen. Analgesics (also known as "painkillers") are used to relieve pain (achieve analgesia). The word analgesic derives from Greek "αν-" (an-, "without") and "άλγος" (álgos, "pain"). Analgesic drugs act in various ways on the peripheral and central nervous systems; they include paracetamol (para-acetylaminophenol, also known in the US as acetaminophen), the non-steroidal anti-inflammatory drugs (NSAIDs) such as the salicylates, and opioid drugs such as hydrocodone, codeine, heroin and oxycodone. Some further examples of the brand name prescription opiates and opioid analgesics that may be used recreationally include Vicodin, Lortab, Norco (hydrocodone), Avinza, Kapanol (morphine), Opana, Paramorphan (oxymorphone), Dilaudid, Palladone (hydromorphone), and OxyContin (oxycodone). Stimulants, also known as "psychostimulants", induce euphoria with improvements in mental and physical function, such as enhanced alertness, wakefulness, and locomotion. Due to their effects typically having an "up" quality to them, stimulants are also occasionally referred to as "uppers". 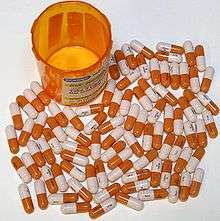 Depressants or "downers", which decrease mental and/or physical function, are in stark contrast to stimulants and are considered to be their functional opposites. Stimulants enhance the activity of the central and peripheral nervous systems. Common effects may include increased alertness, awareness, wakefulness, endurance, productivity, and motivation, arousal, locomotion, heart rate, and blood pressure, and a diminished desire for food and sleep. Use of stimulants may cause the body to reduce significantly its production of natural body chemicals that fulfill similar functions. 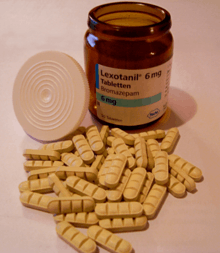 Until the body reestablishes its normal state, once the effect of the ingested stimulant has worn off the user may feel depressed, lethargic, confused, and miserable. This is referred to as a "crash", and may provoke reuse of the stimulant. Catnip Catnip contains a sedative known as nepetalactone that activates opioid receptors. In cats it elicits sniffing, licking, chewing, head shaking, rolling, and rubbing which are indicators of pleasure. In humans, however, catnip does not act as a euphoriant. Cannabis Tetrahydrocannabinol, the main psychoactive ingredient in this plant can have sedative and euphoric properties. Stimulants: "Psychomotor stimulants produce locomotor activity (the subject becomes hyperactive), euphoria, (often expressed by excessive talking and garrulous behaviour), and anorexia. 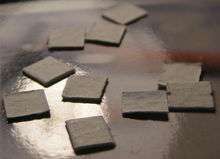 The amphetamines are the best known drugs in this category..."
MDMA: The "euphoriant drugs such as MDMA (‘ecstasy’) and MDEA (‘eve’)" are popular amongst young adults. MDMA "users experience short-term feelings of euphoria, rushes of energy and increased tactility." Opium: This "drug derived from the unripe seed-pods of the opium poppy…produces drowsiness and euphoria and reduces pain. Morphine and codeine are opium derivatives." Hallucinogens can be divided into three broad categories: psychedelics, dissociatives, and deliriants. They can cause subjective changes in perception, thought, emotion and consciousness. Unlike other psychoactive drugs such as stimulants and opioids, hallucinogens do not merely amplify familiar states of mind but also induce experiences that differ from those of ordinary consciousness, often compared to non-ordinary forms of consciousness such as trance, meditation, conversion experiences, and dreams. Psychedelics, dissociatives, and deliriants have a long worldwide history of use within medicinal and religious traditions. 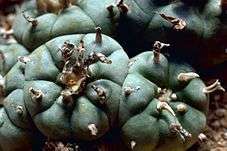 They are used in shamanic forms of ritual healing and divination, in initiation rites, and in the religious rituals of syncretistic movements such as União do Vegetal, Santo Daime, Temple of the True Inner Light, and the Native American Church. When used in religious practice, psychedelic drugs, as well as other substances like tobacco, are referred to as entheogens. Starting in the mid-20th century, psychedelic drugs have been the object of extensive attention in the Western world. They have been and are being explored as potential therapeutic agents in treating depression, post-traumatic stress disorder, Obsessive-compulsive disorder, alcoholism, and opioid addiction. Yet the most popular, and at the same time most stigmatized, use of psychedelics in Western culture has been associated with the search for direct religious experience, enhanced creativity, personal development, and "mind expansion". The use of psychedelic drugs was a major element of the 1960s counterculture, where it became associated with various social movements and a general atmosphere of rebellion and strife between generations. "Triple C's, Coricidin, Skittles" refer to a potentially fatal formulation containing both dextromethorphan and chlorpheniramine. Inhalants are gases, aerosols, or solvents that are breathed in and absorbed through the lungs. While some "inhalant" drugs are used for medical purposes, as in the case of nitrous oxide, a dental anesthetic, inhalants are used as recreational drugs for their intoxicating effect. Most inhalant drugs that are used non-medically are ingredients in household or industrial chemical products that are not intended to be concentrated and inhaled, including organic solvents (found in cleaning products, fast-drying glues, and nail polish removers), fuels (gasoline (petrol) and kerosene), and propellant gases such as Freon and compressed hydrofluorocarbons that are used in aerosol cans such as hairspray, whipped cream, and non-stick cooking spray. A small number of recreational inhalant drugs are pharmaceutical products that are used illicitly, such as anesthetics (ether and nitrous oxide) and volatile anti-angina drugs (alkyl nitrites). The most serious inhalant abuse occurs among children and teens who "[...] live on the streets completely without family ties." Inhalant users inhale vapor or aerosol propellant gases using plastic bags held over the mouth or by breathing from a solvent-soaked rag or an open container. The effects of inhalants range from an alcohol-like intoxication and intense euphoria to vivid hallucinations, depending on the substance and the dosage. Some inhalant users are injured due to the harmful effects of the solvents or gases, or due to other chemicals used in the products that they are inhaling. As with any recreational drug, users can be injured due to dangerous behavior while they are intoxicated, such as driving under the influence. Computer cleaning dusters are dangerous to inhale, because the gases expand and cool rapidly upon being sprayed. In some cases, users have died from hypoxia (lack of oxygen), pneumonia, cardiac failure or arrest, or aspiration of vomit. Dried Cannabis flowers, containing THC and other cannabinoids known as cannabis. A lit cigarette, containing tobacco, which contains nicotine. 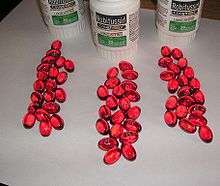 Tablets containing MDMA, widely known as "ecstasy"
DXM, a cough medicine which acts as a dissociative hallucinogen in large doses. Whippets containing nitrous oxide, commonly known as "laughing gas"
↑ Pomara, C; Cassano, T; D'Errico, S; Bello, S; Romano, AD; Riezzo, I; Serviddio, G (2012). "Data available on the extent of cocaine use and dependence: biochemistry, pharmacologic effects and global burden of disease of cocaine abusers.". Current medicinal chemistry. 19 (33): 5647–57. doi:10.2174/092986712803988811. PMID 22856655. ↑ Nutt, D; King, LA; Saulsbury, W; Blakemore, C (24 March 2007). "Development of a rational scale to assess the harm of drugs of potential misuse.". Lancet (London, England). 369 (9566): 1047–53. PMID 17382831. ↑ Stampfer MJ, Kang JH, Chen J, Cherry R, Grodstein F (Jan 2005). "Effects of moderate alcohol consumption on cognitive function in women". N Engl J Med. 352 (3): 245–53. doi:10.1056/NEJMoa041152. PMID 15659724. ↑ Hines LM, Stampfer MJ, Ma J (Feb 2001). "Genetic variation in alcohol dehydrogenase and the beneficial effect of moderate alcohol consumption on myocardial infarction". N Engl J Med. 344 (8): 549–55. doi:10.1056/NEJM200102223440802. PMID 11207350. ↑ Berger K, Ajani UA, Kase CS (Nov 1999). "Light-to-moderate alcohol consumption and risk of stroke among U.S. male physicians". N Engl J Med. 341 (21): 1557–64. doi:10.1056/NEJM199911183412101. PMID 10564684. ↑ Mukamal KJ, Conigrave KM, Mittleman MA (Jan 2003). "Roles of drinking pattern and type of alcohol consumed in coronary heart disease in men". N Engl J Med. 348 (2): 109–18. doi:10.1056/NEJMoa022095. PMID 12519921. ↑ "Drug harms in the UK: a multi-criteria decision analysis", by David Nutt, Leslie King and Lawrence Phillips, on behalf of the Independent Scientific Committee on Drugs. The Lancet. ↑ Charles E. Faupel; Alan M. Horowitz; Greg S. Weaver. The Sociology of American Drug Use. McGraw Hill. p. 366. ↑ "Failed states and failed policies, How to stop the drug wars". The Economist. 5 March 2009. Retrieved 10 March 2009. ↑ Moyer, VA; U.S. Preventive Services Task, Force (May 6, 2014). "Primary care behavioral interventions to reduce illicit drug and nonmedical pharmaceutical use in children and adolescents: U.S. Preventive Services Task Force recommendation statement.". Annals of Internal Medicine. 160 (9): 634–9. doi:10.7326/m14-0334. PMID 24615535. ↑ "National Drug Strategy Household Survey detailed report: 2013". 1 2 3 4 5 6 7 8 9 "marijuana: History of Marijuana Use". infoplease.com. ↑ MacDonald, Keza (5 November 2014). "Why Are Drugs Always So Lame in Video Games?". Vice. Retrieved 16 November 2014. ↑ John Philip Jenkins. "methamphetamine (drug) – Britannica Online Encyclopedia". Britannica.com. Retrieved 29 January 2012. ↑ Cruickshank, CC; Dyer, KR (July 2009). "A review of the clinical pharmacology of methamphetamine". Addiction. 104 (7): 1085–1099. doi:10.1111/j.1360-0443.2009.02564.x. PMID 19426289. ↑ Malenka RC, Nestler EJ, Hyman SE (2009). "15". In Sydor A, Brown RY. Molecular Neuropharmacology: A Foundation for Clinical Neuroscience (2nd ed.). New York: McGraw-Hill Medical. 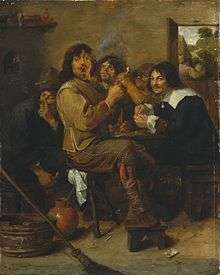 p. 370. ISBN 978-0-07-148127-4. Unlike cocaine and amphetamine, methamphetamine is directly toxic to midbrain dopamine neurons. ↑ "Pharmacokinetics and Pharmacodynamics of Methylecgonidine, a Crack Cocaine Pyrolyzate". aspetjournals.org. ↑ Albert Hofmann. "LSD My Problem Child". Retrieved 19 April 2010. ↑ "Brecher, Edward M; et al. (1972). "How LSD was popularized". Consumer Reports/Drug Library". Druglibrary.org. Retrieved 20 June 2012. ↑ United States Congress (24 October 1968). "Staggers-Dodd Bill, Public Law 90-639" (PDF). Retrieved 8 September 2009. ↑ Hofmann A, Heim R, Tscherter H (1963). "Phytochimie – présence de la psilocybine dans une espèce européenne d'agaric, le Psilocybe semilanceata Fr." [Phytochemistry – presence of psilocybin in a European agaric species, Psilocybe semilanceata Fr.]. Comptes rendus hebdomadaires des séances de l'Académie des sciences (in French) 257 (1). pp. 10–12. ↑ Wonnacott S (February 1997). "Presynaptic nicotinic ACh receptors". Trends in Neurosciences. 20 (2): 92–8. doi:10.1016/S0166-2236(96)10073-4. PMID 9023878. ↑ "Erowid DMT (Dimethyltryptamine) Vault". Erowid.org. Retrieved 20 September 2012. ↑ "MSDS Glossary". Retrieved 1 January 2009. ↑ Morgan Christopher J.; Abdulla A.-B. Badawy (2001). "Alcohol-induced euphoria: exclusion of serotonin". Alcohol and Alcoholism. 36 (1): 22–25. doi:10.1093/alcalc/36.1.22. ↑ Foster, Steven (2002). A field guide to Western Medicinal Plants and Herbs. New York: Houghton Mifflin Company. p. 58. ↑ "NIDA - Research Monographs - Monograph Index" (PDF). drugabuse.gov. ↑ Al Zarouni, Yousif (2015). 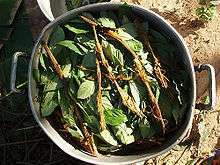 The Effects of Khat (Catha Edulis) (First ed.). London: Yousif Al Zarouni. pp. 4–5. ISBN 978-1-326-24867-3. Wikimedia Commons has media related to Recreational drug use.